Brother and sister, Maurice and Jeanne Magnin bequeathed their art collection and the house where they were born, the beautiful hôtel Lantin, to the State in 1937 on condition that it maintained its aspect as a private collection and lived-in residence with the paintings hanging close together on the walls. These conditions now constitute a challenge for Rémi Cariel who has to manage a rather large collection (1300 paintings, 700 drawings along with an ensemble of furniture and art objects) in a cramped though magnificent space. Since there is no designated space for temporary exhibitions, the one currently highlighting portraits has invaded practically all of the rooms housing the permanent collection. We might be inclined to protest, but the 200 or so works exhibited, including 150 paintings, in fact all come from the Magnin collection (except for three paintings loaned by French museums) and since half of these were kept in storage, this is an excellent opportunity to rediscover them, especially since some have also been restored. The subject of portraits as the guiding theme was a natural choice as the collection is particularly rich in likenesses, ranging from the 16th to the 19th century, French, Italian, Northern European... "Strange Faces" which seem to elude the painter and visitors alike, as evoked in a painting placed with a somewhat humorous touch on the catalogue cover, showing a woman revealing only the nape of her neck (ill. 1). The thematic itinerary is at times a bit artificial, but it was the most adequate solution, not only because the permanent hang is organized chronologically and by school, calling for a renewed look, but also because it is difficult to show the evolution of the portrait with works which are not necessarily indispensable masterpieces, thus an ensemble which was not meant to reflect a panorama of art history. 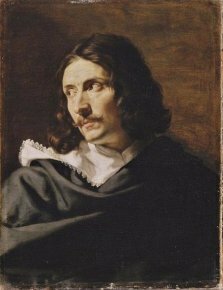 The exhibition explores the frontiers of this genre, including expression heads such as Pain by Lehmann and figures, rather than persons, like Figure of an Old Man by Jordaens and Peasant in the Roman Countryside by Gérôme. In the same way, the section entitled "Exercising a Position" shows both official military or church portraits all identified, such as this portrait of Nicolas Petitpied after François Jouvenet, and for which the museum brought the original (a loan from the Musée de Port-Royal des Champs) offering a comparison, but also anonymous figures who perhaps never held a name and embody above all a position, for example this Courtesan (16th century anonymous Florentine) or this attractive Viola Player by Cariani (ill. 2). Some of the sections fit in quite naturally with the subject, such as the "self-portrait", the "profile" including notably the superb and unflattering woman’s portrait by Carolus-Duran, "the ages of life" and the mysterious portrait of a young man by Nicolas Regnier illustrating perfectly the androgynous ambiguity of youth (ill. 3), as well as the costumed likenesses, the mythological portraits evoking the taste for the exotic or the Orient ; Guérin for instance plays with turban effects, which he places on the head of a member of the expedition to Egypt along with an Oriental, lent by the Musée de Chambéry. As for the Sultan’s Wife who looks at the spectator with a graceful face, this is an imaginary portrait attributed to Claude Dubufe. Other sections leave viewers somewhat frustrated, such as the "geometry" part referring to Poussin which compares women to the columns of the Maison Carrée in Nîmes and also to Rubens for whom "the elements or principles of the human figure can be reduced to a cube, circle or triangle" ; but the works exhibited are by neither Poussin nor Rubens and do not always illustrate the idea in an obvious way. 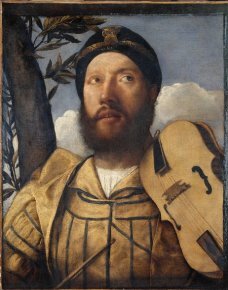 In the section, "oblique looks", we particularly noted this man’s portrait (ill. 4). 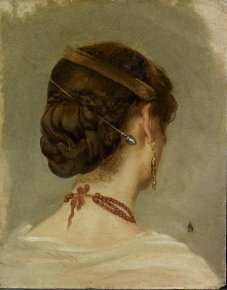 The artist gives the impression of having surprised his model inadvertently and regales us with the beautiful effect of the upright white collar trimmed in lace. There are no accessories suggesting either the identity nor the position of this figure. 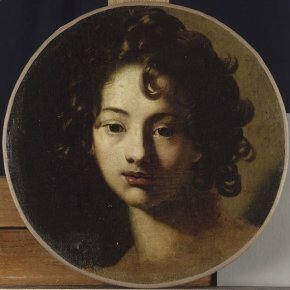 At first attributed to Vouet , it is today considered as coming from the circle of Philippe de Champaigne as suggested by Arnauld Brejon de Lavergnée in the catalogue , pointing out that Pierre Rosenberg has also on his side put forth the comparison. 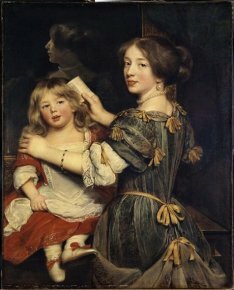 Among the "intimate portraits" a masterpiece by Claude Lefebvre clearly stands out : Catherine, the Painter’s Eldest Daughter, Combing her Little Brother, reflects familial happiness (ill. 5). The action of the figures, the free gestures, the bold composition underscored by the effect of the mirror and a detailed rendering of the fabrics explain the painting’s success which was in fact attributed to an Antwerp painter, Gonzales Coques (1618-1684) during the 19th century. 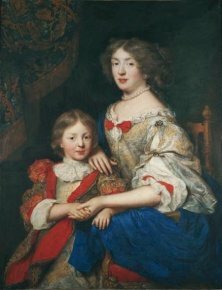 The curator establishes a dialogue between this double portrait and another painting exceptionally lent by the Musée in Dole  : Portrait of Madame de Sillery and her Son (ill. 6). Originally given to Peter Lely (1618-1680), then to Pierre Mignard (1612-1695) notably by Georges de Lastic, specialists now attribute it to Claude Lefebvre, notably thanks to a studio replica auctioned off at the Hôtel Drouot in Paris on 6 June 2005, with the model’s name inscribed on the stretcher. The juxtapositon of these two canvases is very interesting since, though the second is quieter and more static, a commissioned and majestic portrait, both compositions distill tenderness and intimacy thanks to the play of the hands and the close positions of the bodies. 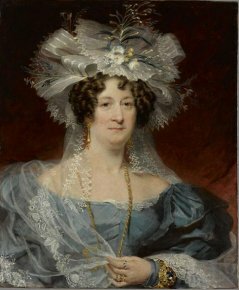 A room entitled "beauty in question" assembles rather unattractive portraits by artists who are nevertheless competent in their skills ; these will no doubt return to storage after the exhibition. However, they serve to remind us that portraits do not have only an aesthetic purpose, but are also a reminder of the past. Moreover, these works reveal the evolution of taste as well as of the faces themselves. The last section is particularly lively with various headwear, ruffs, ornaments, jewelry and accessories. The Irish artist James Heath Millington engulfs his model in layers of lace to make us better forget his long nose and double chin (ill. 7). This exuberance contrasts with the austere coif and veil overshadowing the dark complexioned face of Mother Saint Prosper on her Deathbed in a beautifully dramatic effect. 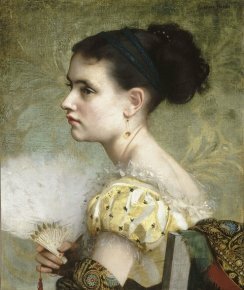 Finally, the stunning portrait of the Woman with a Fan and her pouting look by Jacquet (ill. 8), illustrates this phrase by Baudelaire "while loving beauty in general, expressed by classical poets and artists, we should not neglect beauty in particular, circumstantial beauty and character traits." Visitor information : Musée Magnin, 4 rue des Bons Enfants, 21000 Dijon. Tel : 00 33 (0)3 80 67 11 10. Open from Tuesday to Sunday, 10 am to 12 noon and from 2 pm to 6 pm. Admission : 3.50€ (reduced : 2.50€). Exhibition catalogue p. 17 : 1935 exhibition, Les Peintres de la réalité (Charles Sterling). We find it regretful in a way that not all the works are reproduced in the catalogue and that those which do appear do not all have accompanying entries. 10/7/12 : The two paintings are studied by Jean-Claude Boyer (the author of both catalogue entries) who had already attributed the double portrait from the Musee Magnin to Claude Lefebvre. He told us that their comparison, thanks to their juxtaposition at the exhibition, now shows that the Dole painting is indeed by the same artist.